Posted on Aug 3, 2016 by Jason Stegent. This is where it all starts. Your abstract needs to immediately tell a story that resonates with your audience. Take away the fluff and focus on what the webinar is going to cover. What challenges in the marketplace are going to be addressed in this webinar? What educational benefits are folks going to get out of attending? Customize the page to meet your message – banners, logos, pictures, videos, etc. – and optimize it to reach a larger audience and improve registration to attendee conversions (social media integration, save to Outlook and Google calendars, etc.). As soon as people register they should receive a confirmation email with webinar details – links, dates, times, test your system instructions, etc. You should also send them two reminder emails – typically a week before and the morning of. But how about being a little different? Instead of just sending them a boring instruction manual on how to access the webinar and view it optimally, why not include a piece of content that will give them value and touches on some of the points that your upcoming webinar is going to cover? It could be a link to an on-demand webinar, a link to your blogs, a collection of videos or pieces of literature that support what you’re going to be speaking about during the webinar (eBooks, Whitepapers, etc.). These emails should be seen as an extra way to provide value for a prospect that has already shown interest by registering for your webinar. They’ve entered the funnel, not it’s time to nurture them. The big day is here, but just don’t give them a presentation. Provide an engaging experience. 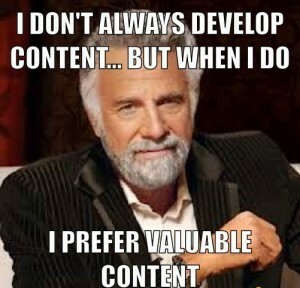 The content has to be top-notch, yes, but give them access to other forms of content within the webinar environment. This provides you with more touch points and more ways to measure their engagement. Q&A is a given, but provide other engagement options. Conduct polls and surveys, providing instant feedback so they can see how they stack up against their peers. Provide the ability to download content related to the presentation – webinar slides, literature, videos, blogs, etc. Give them the ability to automatically register for your next webinar while they’re watching your current webinar. This is a great way to increase attendance for future events and provides an easier way for folks to attend your upcoming webinars. They’re watching your webinar and like what they’re hearing…why wouldn’t they want to see what you have in store for your next event? Give them more value than they bargained for. It drives me absolutely crazy how overlooked this part of the process is. Don’t just send them a “Thank You” or “Sorry we missed you” email with a link to the on-demand version. Do that PLUS provide access to the slide deck (if they attended); drive them to your blogs and social media pages; give them a great piece of follow-up content and provide access to the resource library on your site; if they haven’t already registered for your next webinar, take them to a place where they can easily sign up for any of your upcoming webinars. You’ve got your prospects at a place where they’re a sponge…give them access to quality content and allow them to soak in all of the value you can drive for them and their organization. This entry was posted in Recent Blog Posts on August 3, 2016 by Jason Stegent.